When I was a kid and my mom would go out of town, my dad would make special dinners- the kind of thing that either she didn’t like, or that she considered too messy. 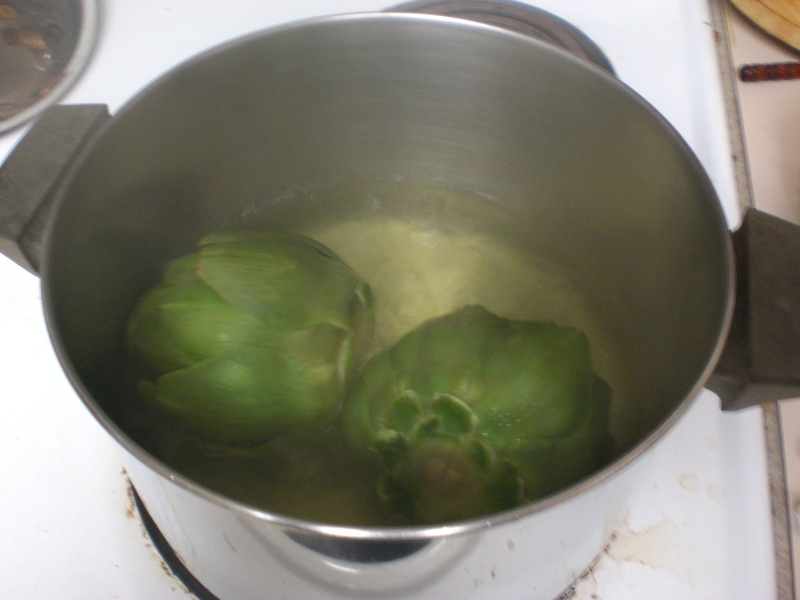 Artichokes were sometimes on the menu for these meals. And, funnily, I don’t remember anything else on the menu those nights, that was the whole meal- just artichokes, dipped in melted butter. Daddy would cook them in the pressure cooker, spread out newspapers on the top of the portable dishwasher in the middle of the kitchen, melt butter in a tiny pan on the stove top (it wasn’t before microwaves were invented, but it was before we had one) and we’d all stand around, ripping leaves off, dunking them in butter and scraping the flesh off with our teeth. Once we got down to the chokes, the feathery tiny leaves that stick in your throat, my dad would trim them with a paring knife and distribute the pieces of heart fairly. Fairness in heart distribution was a big issue. It’s the kind of thing that if you don’t have a childhood memory of it, you probably don’t eat. They are a bit of a pain to make, and eat, and dispose of, as well as looking intimidating in the produce section. However, they are so good- rich in their own right plus extra good with the butter…. Can I suggest that you create a good memory of it? right now? To cook- trim off the bottom stem, and the bottom row of leaves- these are tough anyway, and take forever to cook. At our house, 3 of us like artichokes, and cooking 2 is enough. To eat, you pluck off the leaves, dunk in butter, then scrape off the soft stuff from the insides of the leaves with your teeth. Turn the leaves upside down and scrape with your bottom teeth. The closer you get to the center, the more “soft stuff” there is- once the tops of the leaves turn purplish, you can bite off the bottom 1/3rd of the leaf. Once you get to the stuff that looks like chick feathers, trim that off, and you have the heart- distribute it fairly. Sop it in the rest of the butter and enjoy. 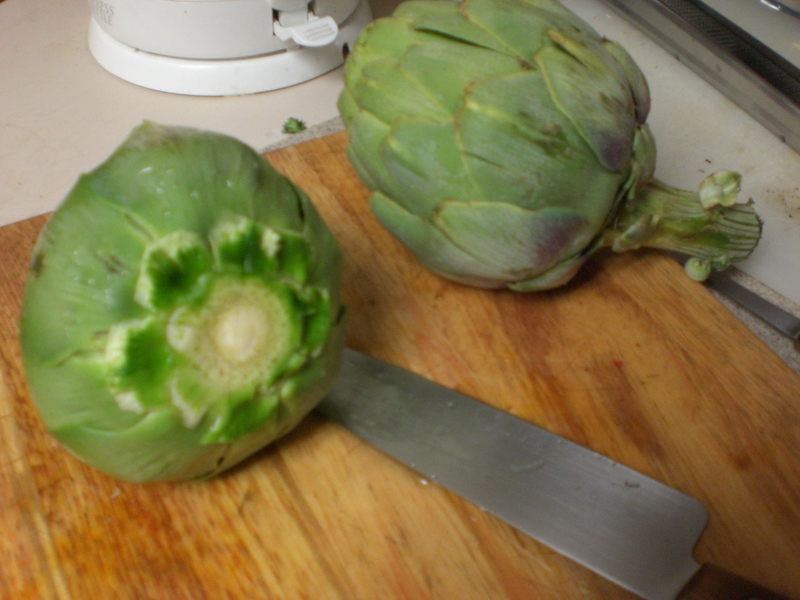 I have tried to grow artichokes here in zone 5, and it is possible, although they don’t overwinter here. In warmer places, they are perennial, and produce more buds every year. I have read directions on the interwebs about pulling the roots at the end of the season, and storing them in the basement, the way people do with dahlias. I’ll try that this fall with the plant I have growing in the basement under lights. Previous Let’s move the compost bin Next Ack! Undormant Fig Tree! I’m trying to grow artichokes for my first time in what hardiness zone maps call anywhere from zone 5b to zone 7a. So far, the plants are in the starting container. I may pot them up soon and set them outdoors in early-to-mid May… hoping a few cold nights convince them they’re starting a second year so they produce better (if at all). It’s all theory so far! That’s what I’m trying too- I learned that it may be possible to bring the roots inside and overwinter them as if they were dahlias, so that’s what I’ll try this coming winter. But if we get some chilly nights this spring, they may think they have had a winter already…who would think we’d be lying to plants?